My Plate: January 16, 2012 Why Wouldn’t You Just Eat An Egg? 5 Reasons to Make Sourdough Your Only Bread. Sourdough bread does have a bit of a learning curve, but once you figure it out you’ll have no trouble at all. One key thing to remember is that the wild yeast takes longer to raise, so give your bread some time. The temperature of your house will also affect the leavening action of the sourdough. We keep our home very cold in winter and thus I use a higher percentage of starter and let my dough ferment for about twice as long as most recipes recommend. If you want to learn the art of sourdough baking, I’d highly recommend reading The Bread Builders: Hearth Loaves and Masonry Ovens. This is a very in depth look at sourdough, probably more information than you want to know, but it is the book that really cemented my knowledge of sourdough and helped me understand the process fully. After reading through this book I feel very confident every time I make sourdough and I’m even able to adapt non-sourdough recipes to sourdough. It doesn’t contain recipes per se, but parameters for baking, you’ll want to find a go-to recipe that works for you. My favorite sourdough recipe is Norwich More Sourdough from Wild Yeast Blog (this one has a higher % of starter which makes it perfect for my cold house and the winter months). If you don’t want to get too in depth on the chemistry of sourdough, you can read Classic Sourdoughs, Revised: A Home Baker’s Handbook. The information is basic and very good, the recipes are very simple and easy to make. 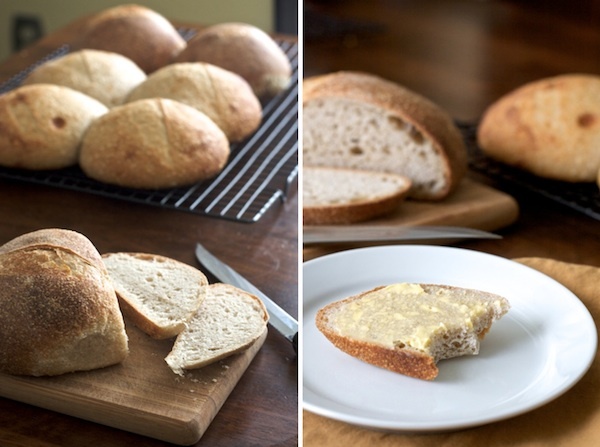 Following these simple methods you’ll be making wonderful sourdough whenever you want. This book and the one mentioned above also recommend a different method of starter maintenance that only requires weekly feedings. I have found this to be the key for keeping my starter from getting too sour and strong. I cannot recommend these books more highly for the sourdough baker! If you could only eat one kind of bread for the rest of your life what would it be? If I HAD to eat only 1 kind of bread for ever it would be a toss-up between sourdough and russian dark rye. One of my goals, or “to dos” for 2012 is to learn to make sourdough bread. So thank you for this post! I have been making a few different breads with the no knead method. Olive being my favorite so far. But a good tangy sourdough is absolutely my favorite bread. If I had to choose – I’d choose sourdough. If you like the quick bread method you’ll really like the Classic Sourdough book listed above. I would still recommend reading the other book as it’s a great primer and really goes into the details of sourdough. There just isnt anything else in the world like em. Yum! 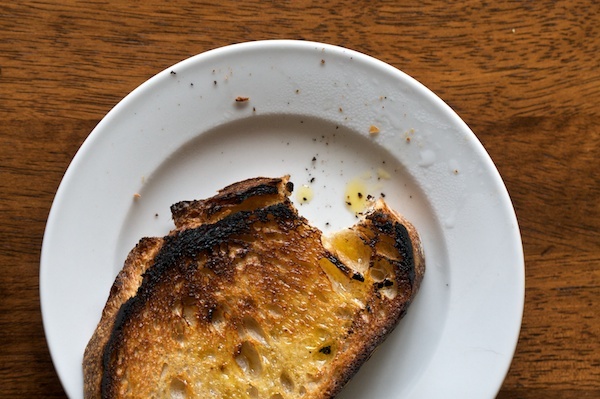 We don’t eat much bread here either anymore, not because of gluten insensitivities (at least now with sourdough bread), but we are trying to limit our consumption on grains as they can take up a lot of your daily calorie intake without adding as much nutrition as good healthy fat and vegetables. I’m on a bread making mission this month but not yet taken the plunge with the sourdough even though I have the starter ready to go. I just need the courage to dive in and be prepared to learn as I go. I’d highly recommend getting your hands on a copy of Classic Sourdoughs, Revised: A Home Baker’s Handbook – it’ll be the quick primer you need for getting your sourdough baking on track. Once you get into it, read through The Bread Builders and then the light bulb will go off and you’ll understand what’s going on and how to make your own sourdough recipes and amend other recipes you like. Thanks for the post on sourdough. I got going on it last year but my starter got severely neglected over the Christmas holidays so I think I need to start it again. Would you mind giving a bit more information on how you feed your starter? Mine seemed to struggle if I fed it less often than daily which used loads of flour and was not very inefficient when you’re only baking for one! I know exactly what you mean! I feed my starter once a week following the guidelines that both books above recommend. Basically you feed your starter (so 120 grams of starter and add 60 grams of water & 60 grams of flour), then let it sit on the counter for an hour and into the fridge it goes. That way the fermentation will slow and your starter won’t get too acidic either. You feed it only once a week this way (though I admit to going 2 and the starter is still really strong). It seems to be working like a charm for me. Sorry this comment is not about sour dough, it is about the sticky chicken thighs in Jamie Olivers book.I wanted to make them but thought that 12 chicken thighs sounded a bit excessive for 4 servings. Just wanted your thoughts on the portions it serves as you have made it. Love the new blog by the way. I made it for four and several people ate 2 chicken thighs. Since we use pastured local chicken, I usually just use the whole chicken cut up for this recipe instead of just the thighs (though I usually eat the thighs as I’m a dark meat gal). You will have leftovers I’m thinking if you use 12. 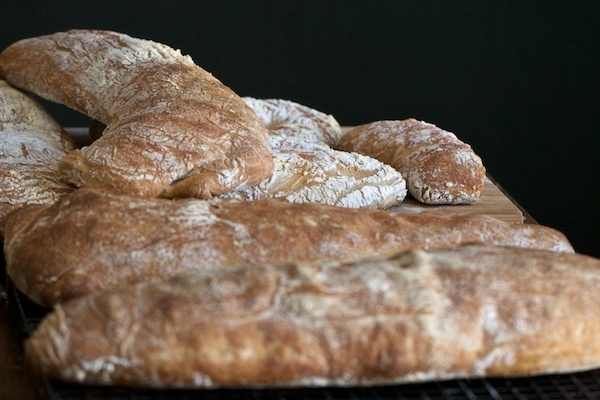 Sourdough bread is my favorite, followed by Italian Ciabatta ~ they are both staples in this house. No,but I will ~ sounds like a wonderful idea. I use to make bread all the time when my daughter was a tiny baby and I was working part time. I made a loaf of bread this weekend, the first time in 17 yrs. (bread machine not counted) I remembered how much I enjoyed it! I broke out my 20yr old book Laurel’s Kitchen Bread Book to reread. One of these days I might just take on making some sourdough bread! We still eat a lot of bread here! Thank you for the sourdough book recommendation. I think I’ve decided to order it! I’m also going to order Nourishing Traditions–that also sounds like a great book! You’ll love nourishing traditions – very eye opening! OK – So I just read Classic Sourdoughs and even though I am feeling overwhelmed and my head spinning with proof times and temperatures, I am taking the plunge. I have ordered the New Zealand starter and I am going to try. I am a little worried, as I am easily discouraged. So keep your fingers crossed! I’m in PN, NZ and have just made my first sour dough bread this weekend using a starter and then a bread recipe I got from my daughter who’s a chef in Hawkes Bay. Although not perfect I’m pretty pleased with the result. Need to work on my “shaping” a bit more though. Learning to bake bread is a process. Each time you make it you’ll learn to vary it slightly to get the outcome that you want.